October | 2014 | First Nations Film and Video Festival, Inc.
Chicago, IL) Applications are now being accepted for the Diverse Voices In Docs 2015 program! 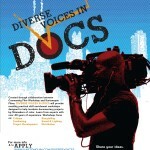 Apply at kartemquin.com/diversevoices before December 19th! 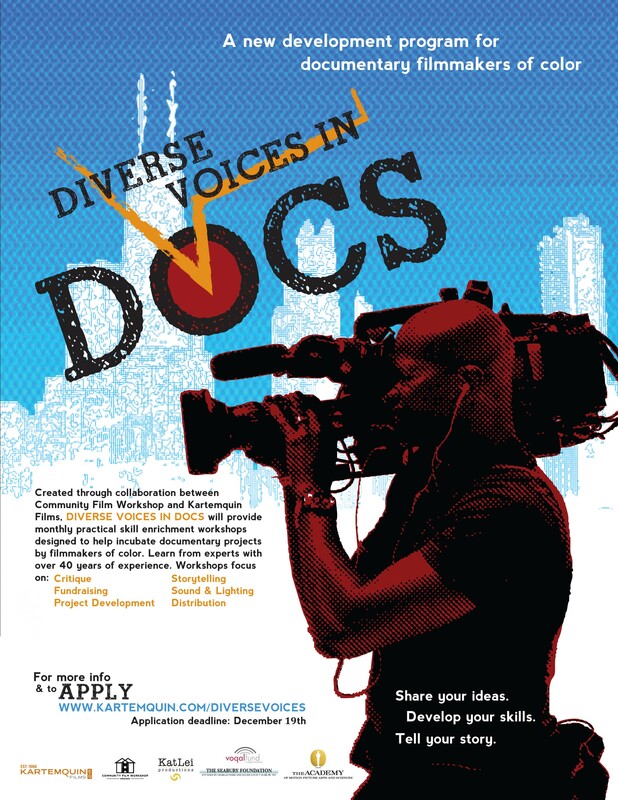 Diverse Voices in Docs (#DVID) is a professional development and mentorship program for documentary makers of color, organized by Kartemquin Films and the Community Film Workshop of Chicago. At the core of the fellowship are six engaging three-hour workshops at the Community Film Workshop, with creative advice provided by Kartemquin Films’ world-class staff and associates. Each session will provide practical skill-enrichment designed to help incubate your next documentary project, as well as time to network and share experience with your cohort of participants. Applicants should be filmmakers who have played a principal role in a completed production (producer, writer, director, editor, etc.) and have experience or work history that demonstrated their commitment to social issue documentary. We will facilitate continued engagement throughout the six-month workshop program, and connect you to an expert community, new collaborators, and a wider network of funders and distributors. The program will culminate in exposure through a final public exhibition. For more information on the program please email Beckie Stocchetti, Kartemquin Community Engagement Manager at beckie@kartemquin.com or visit kartemquin.com/diversevoices. FNFVF Director’s Note: FNFVF Inc. encourages Native American film and video makers to apply! UPDATE: NEW TIMES FOR MEZTLI GALLERY EVENT. CHICAGO, IL) First Nations Film and Video Festival Inc is please to announce its programming for its fall festival taking place November 5th through the 8th. The feature film this year will be Julianna Brannum’s “Indian 101” a documentary feature on the life of activist Ladonna Harris. The film will screen at all venues with selected short films to precede the feature. Short films include “Silverback” by Lucas Rowley, re-screening of popular short films “Locked Doors” by Arlene Bowman and “Salmon Spearing” by Annabella Brueker. Also included on the program is “Scenes from HAMLET” directed by Ernest M Whiteman III, which is a contemporary adaptation of Shakespeare’s play in production now as a full-length feature film that features an all-Native American cast. 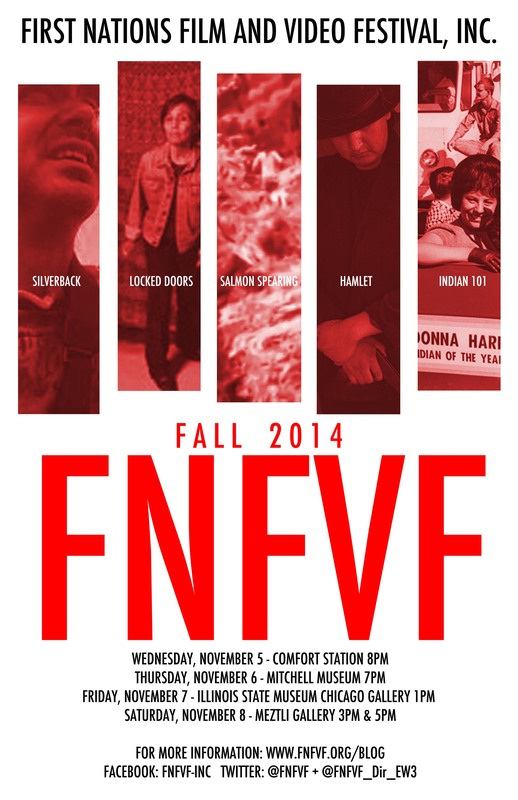 The Fall edition of the First Nations Film and Video Festival opens at the Comfort Station in the heart of Logan Square at 8pm on Wednesday, November 5th. Mitchell Museum in Evanston then hosts “Indian 101” on Thursday, November 6th at 7pm. The festival continues at the Illinois State Museum Chicago Gallery at 1pm on Friday, November 7th. The festival closes on Saturday November 8th with repeated programs at 3pm and 5pm at the Meztli Cultural Center in Pilsen. The Spring Festival takes place May 1st through the 10th of 2015 and plans are already in progress for programming and films. The Self-representation of Native people is the primary reason why the First Nations Film and Video Festival exists and works hard to provide that Native first-voice to wide audiences across Chicago. Support the FNFVF by attending a screening and seeing films being shown nowhere else in Chicago. The fall edition of the First Nations Film and Video Festival runs November 5th through the 8th across Chicago and beyond. For more information, visit www.fnfvf.org. Visit us on social media at facebook.com/FNFVF-Inc or twitter.com/FNFVF_Dir_EW3. We look forward to seeing you at the screenings! Director, First Nations Film and Video Festival Inc.